Computerized accounting practice set, including and using a fully operational version ofQuickBooks Pro 2018 (commercially available accounting software for smaller companies). Early chapters provide installation, familiarization and practice and are followed by a case project of recording transactions and adjustments, performing month–end procedures and recording year–end adjusting entries. The final chapter covers setting up a new company. License code that provides access to 160 day version of QuickBooks Pro 2018 (not compatible with Mac). Five company data sets are included in the materials. Two are included by Intuit and the other three by the authors. The Reference book which students first learn to use in Chapters 5 through 8, then use to help them process transactions and do other activities in subsequent chapters. The Student Problems & Cases book including tear out pages to make it easier for students to prepare solutions and for instructors to grade them. Access to digital Instructor’s Guide & Solutions, including considerable detail about how solutions were determined (available to instructors upon request only). All books are in four colors throughout to help students more easily compare their computer screens to the books and to make the materials more appealing. The Reference book provides an overview of each type of transaction or other activity to help students understand what is occurring when the transaction or other activity is processed and the accounts affected by each transaction. Internal controls are covered in Chapter 3, which permits problem materials about processing controls throughout the remaining chapters. The materials require students to use Centers to access windows instead of the Menu Bar. This helps students understand the overall accounting system as they deal with each type of transaction. Estimated completion time: The entire project takes from 20 to 25 hours depending on the use of Chapter 10 (optional) and the number of assignments selected. Assignments include instructions, practice, student problems and cases, and reference material. Chapter 1—Introduction and Software Installation Briefly introduces QuickBooks Pro. This chapter deals with installing the software using stand alone computers, lab settings or network installations. 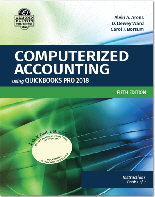 Chapter 2—Familiarization Teaches students how to do such things as opening and closing QuickBooks Pro, opening company data sets, opening a variety of windows using Centers and entering information into windows. Chapter 3—Overview of Maintenance, Processing Information and Internal Controls Provides an overview of maintenance and processing information in QuickBooks Pro. The chapter also deals with processing internal controls. Chapter 4—Obtaining Information Including Reports Provides an overview of how to obtain information in QuickBooks Pro, including information about recorded transactions and analysis of reports. Chapters 5 through 8—Practice Four chapters teach students to process transactions and other activities, organized by accounting cycle. Students then use the information learned in Chapters 5 through 8 and the Reference book to process additional information in Chapters 9 and 10 without additional guidance. Chapter 9—Recording Transactions, Performing Month–end Procedures, Recording Year–end Adjusting Entries, and Printing Reports Students process transactions, perform month–end procedures, record year–end adjusting entries, and print reports for a different company using knowledge gained in Chapters 2 through 8 with only the Reference book as guidance. Chapter 10—New Company Setup Students learn to set up a company starting with no information in any data set. After performing all setup activities, students process a few transactions and prepare reports to hand in. 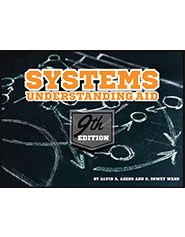 Start them off right with Systems Understanding Aid. 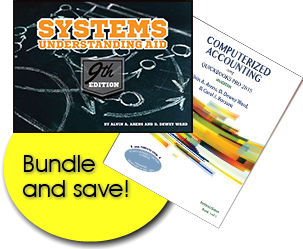 A comprehensive manual accounting practice set that teaches students accounting processes, flow of transactions, documents and records, and recording transactions. Students are able to visualize the entire accounting process, including what happens at each step. They also learn through reading flowcharts and preparing documents and tasks such as reconciling a subsidiary record and control account. After completing Systems Understanding Aid, move ahead with Microsoft Dynamics GPwhich includes a chapter that requires students to process the same transactions and other requirements included in Systems Understanding Aid and compare the results. Upon completion of both projects, students will have a better understanding of what happens in computerized systems. This understanding facilitates exploring such topics as the documents used in computerized systems and computerized internal controls. Students begin using the QuickBooks Pro software in Chapter 1 and continue their learning by utilizing the software to complete a wide variety of activities throughout the course. Students experience processing transactions, performing maintenance, obtaining information from QuickBooks Pro data, printing documents and reports, exporting to Excel and understanding internal controls in QuickBooks Pro. Every activity in the materials includes having the students practice the activity using the computer. Sufficient information is provided in the materials to permit students to learn QuickBooks Pro and complete the problem material without the instructor′s involvement, if that is the instructor′s choice. All materials needed to complete the project are included, including access to the QuickBooks Prosoftware. Repetition of key activities is included to reinforce learning, but it is minimized to keep the time required for the project reasonable and still help students learn the extensive features of QuickBooks Pro. There are extensive problem materials that require students to integrate what they learned in earlier chapters, including questions and problems about the wide variety of QuickBooks Pro features included above. The projects can be completed by students on individual computers, in a computer lab or in a network environment. An extensive and detailed solutions manual is provided to professors to help assign chapters and grade student hand–ins. The entire project takes from 20 to 25 hours depending on the use of optional chapters and the number of assignments selected.